Easy taco salad is perfect for those hot summer days. It is loaded with wonderful vegetables and it is something that your family and friends will truly enjoy. 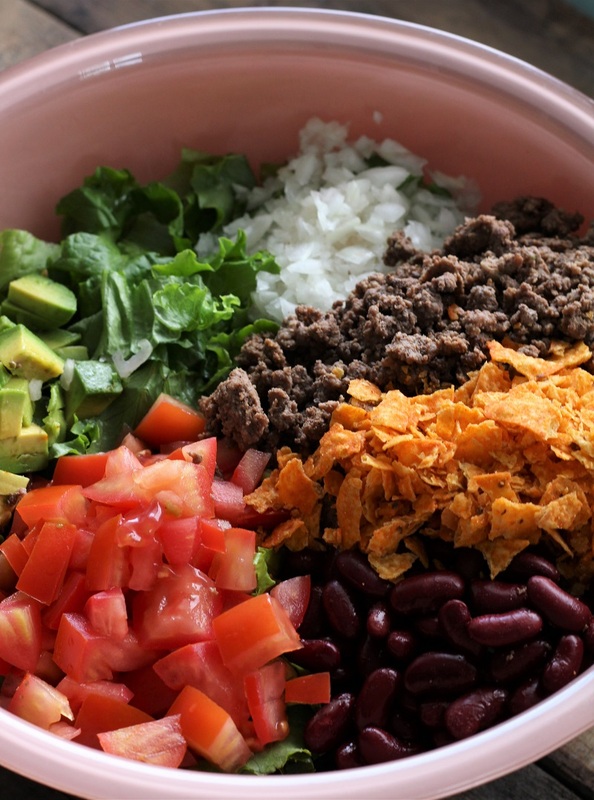 My sister said “why don’t we have this easy taco salad for our family reunion”? I think that that is a great idea. I will get little bags of Doritos and let them add the toppings. So simple, and if every family brings a topping, there is really nothing to it. We have around 50 people. We use to do dutch oven chicken and potatoes, but I think that this year it is time to spend more time playing and visiting, and less time cooking and cleaning. I am 1 of 89 grandchildren on my mom’s side. I don’t even know how my grandparents handled that many grandchildren? I have four and I think that I am picked on, when it comes to giving them all your attention, and birthday and Christmas shopping. It was fun to see some of my cousins that I haven’t seen for years, at an uncle’s funeral today. Guess what, they are growing older too; just like me. (Glad I’m not the only one)! I only wish we could all get together and take a big picture. That would be a lot of fun. Ha ha. It’s hard to get 10 people in a picture. I can’t imagine that many! My uncle’s funeral today, brought back some memories. I remember going and visiting this Uncle and my Aunt. We went into this store that had all these crystal dishes and knick knacks in it. I was eight years old and was with my dad. He was like a bull in a china shop. He picked up this bottle that had a cork with a bottle topper in the top, and he turned it upside down to see how much it cost. When all of a sudden I heard a crash and the top of this bottle fell out and went down through the glass shelf which had a light underneath it and broke the shelf. My dad was a very honest man and this is the only time that I know of when my dad wasn’t honest; he looked at me and said “get the hell out of here”. So I did. Glad none of us had to go to jail. It was a very scary experience and I know that my dad was thinking that he would have to sell the farm if we didn’t leave. I am grateful that my dad was honest in everything else that he ever did and a man of his word. That day we were both scared chickens. So what have you people been doing fun for the summer? We have a family reunion this week on my husband’s side. It is always fun to get together, especially since I am not in charge this year. 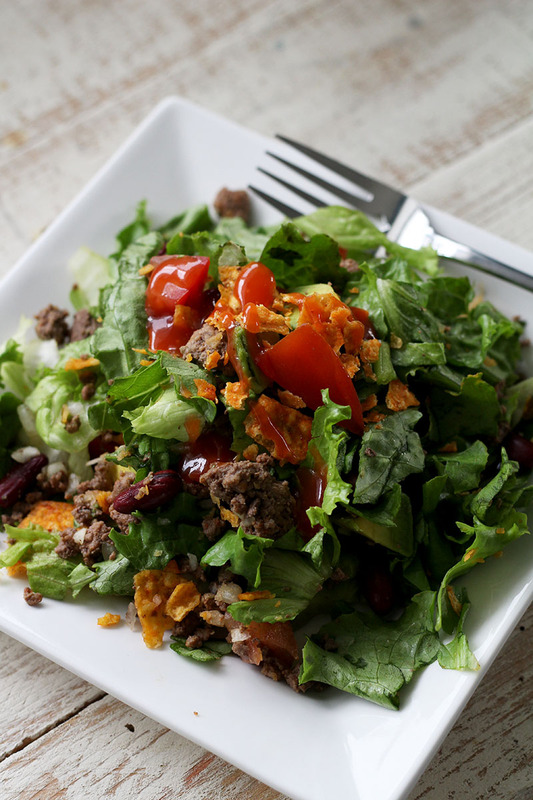 Now, do yourself a favor and go enjoy some of this easy taco salad! 1- This is a great salad for get togethers, just give everyone a bag of there own chips and let them put what they want in the bag. Use the bag as a bowl. 2- Some people like to use Ranch dressing, but I think that Catalina is the best. 3- For added flavor, chopped bacon. In a skillet, cook and drain the ground beef. Let cool completely. In a large bowl, add cooled ground beef, lettuce, tomatoes, kidney beans, onion, grated cheese, avocado, and Doritos. Right before serving, add the dressing (or just let each individual add their own dressing to their individual portions). We are taco lovers but this is a great way to change it up. This is totally my husband’s kind of salad too! 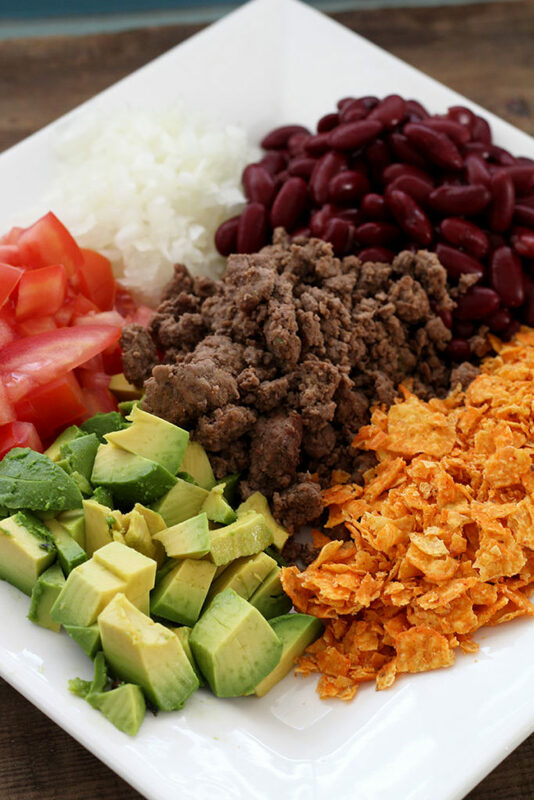 We love tacos too and this really is a nice way to change up the beloved taco! Ah – tomorrow’s lunch! This looks deliciously healthy – Thanks for sharing at the What’s for Dinner party! So glad you stopped by! 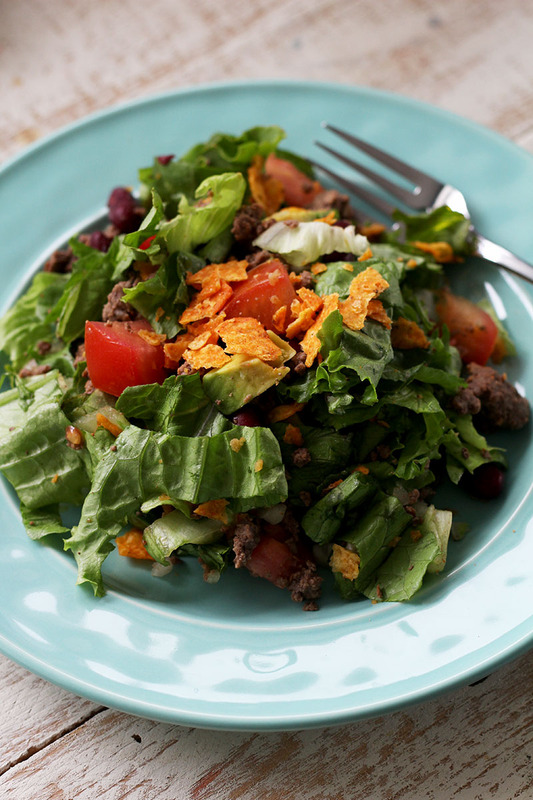 This taco salad is a great lunch. Thank you for coming by and leaving a reply.